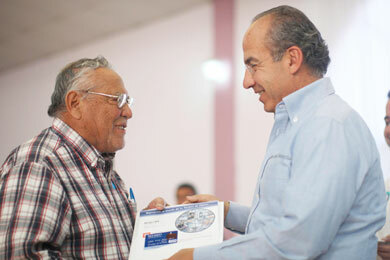 Finally repaying benefits owed to former Mexican migrant workers in the United States, President Felipe Calderon apologized on behalf of successive governments for the delay of up to 60 years. The Bracero (“strong arm”) guest worker program, which ran from 1942 to 1964, was initially prompted by a demand for manual labor during World War II. Under a series of laws and diplomatic agreements, approximately 2.5 million Mexicans were allowed to work on a temporary basis in the United States, mostly in agriculture and the railroad industry. Controversially, the U.S. government deducted ten percent of the workers’ wages during the first seven years of the Bracero Program, supposedly to fund pension schemes and provide an incentive for the Mexicans to return home after their contracts ended. But the money vanished, apparently after U.S. authorities remitted it to Mexican banks. The ex-braceros, who never received the social benefits they were promised while working north of the border, have campaigned for decades for the money they are owed, demanding 100,000 pesos each. President Vicente Fox promised to address their grievances during his successful election campaign in 2000, but was slow to act after taking up office. In 2004, hundreds of frustrated ex-braceros invaded Fox’s ranch in San Cristobal, Guanajuato, demanding action. The following year the federal government finally announced a compensation scheme of 38,000 pesos per person, but many ex-braceros balked at the paltry sum. The initial pay outs were made to 7,800 ex-braceros who worked between 1942 and 1946, with widows and heirs also eligible to collect the settlements. Calderon was accompanied last weekend by Interior Minister Alejandro Poire, who said 27,457 former migrants have now been paid, equivalent to 26 percent of the 193,000 that the government acknowledges are owed money. Parra said there are still thousands of former braceros who were not considered for repayment. According to the Jalisco Center for Migrants and the Elderly, 250,000 braceros migrated from Jalisco to the United States between 1942 and 1964, but just over 22,000 are able to prove it. By saying the debt has now been paid off, Parra believes “Calderon has eliminated the possibility of there being another list” of beneficiaries. While the president claimed that “in good conscience, I have done everything I could,” Parra said he was in fact forced into action by the protests and the Mexican Congress, which approved the payments. The ex-bracero leader added that the only possibility of extending the benefits to those not presently covered is by compelling Congress to pressure the next president of Mexico.